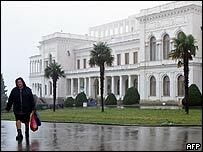 It is 60 years since the three major allied leaders, Roosevelt, Churchill and Stalin, met to divide up the world in the old summer palace of the tsars in the Crimean resort of Yalta - and the dark memories of that conference linger today. 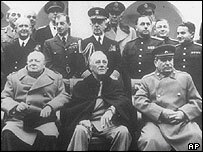 It was at Yalta, between 4 and 11 February 1945, that the first shivers of the Cold War were felt, as the alliance between democracy and communism began to give way to rivalry and hostility. In their book Cold War, Jeremy Isaacs and Taylor Downing state: "The Yalta Conference represented the high-water mark of Allied wartime collaboration." But they add: "Yalta revealed cracks in the Grand Alliance. Only the common objective of defeating Hitler had kept it together." Only in the last few years has the legacy of Yalta finally been overcome, with the re-unification of Germany and the emergence of countries in eastern and central Europe as members of the European Union. The latest example of the cloak of history being shaken off has come with the recent elections in Ukraine, which now owns the Crimean peninsula. Even on the 60th anniversary, controversy remains. 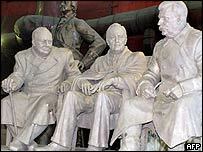 A row has broken out over the installation in the palace of a sculpture of the three leaders. Crimean Tartars have objected to the inclusion of Stalin, who deported them by the tens of thousands for allegedly collaborating with the German invaders. The Yalta talks, held at Stalin's insistence in the then Soviet Union and necessitating a long sea and air journey by the ailing President Roosevelt, came as the Red Army had broken through on the eastern front and the US, British and Canadian armies were still west of the Rhine. Stalin therefore was in a strong position and he used it. He was determined to ensure that whatever the post-war settlement in Europe, there should be no threat to the Soviet Union. He intended to carry this out by placing sympathetic governments in a buffer zone between him and western Europe, especially Germany. For his part, President Roosevelt had two main aims: to get agreement on the formation of the United Nations, and to get Russia to join the war against Japan. He was less worried about the future of Europe and felt that Stalin could be trusted. Winston Churchill felt that Roosevelt was naive about Stalin. He tried to resist the imposition of punitive reparations on Germany and worked to restore the position of France as a significant power to bolster that of Britain. Above all, he tried to stop the extension of Soviet influence, especially in Poland. After all, the defence of Poland was why Britain and France had declared war on Germany in the first place. But though Churchill spoke with a loud voice, Britain by then carried only a relatively small stick. Stalin agreed to fight against Japan (acquiring in the process islands in Kurile chain near Japan) and he agreed to the UN, having first ensured that the Soviet Union would have a veto in the proposed executive body, the Security Council. In return, he insisted on covering the security of the Soviet Union. And here he chose Poland, the most contentious issue in the summit, to make his point and to provide an example of what would eventually happen right across the Soviet satellite states. First, he ensured that Poland's borders were to his liking. So, the Soviet Union acquired much of eastern Poland and Poland was given tracts of eastern and northern Germany in return. Vast movements of populations took place. One of the cities gained by Poland was Danzig, to be re-named Gdansk. The Baltic city provided another example of how fortunes can change. World War II started over Hitler's demands for access to Danzig, and it was in Gdansk that Poland's own modern freedom began, among the shipyard workers led by Lech Walesa. Stalin then won loose language to describe the future governance of Poland, which he intended to be of his choosing. With the Red Army in a powerful position - and having stood by while the Polish nationalists were slaughtered in the Warsaw Uprising - he had already installed a provisional government in Poland, ignoring the government-in-exile which had been operating throughout the war in London. "The Provisional government which is now functioning in Poland should therefore be reorganised on a broader democratic basis with the inclusion of democratic leaders from Poland itself and from Poles abroad." Of course, neither the Americans nor the British could enforce this. It is true that, for a time, Stalin stuck to the agreement. The Polish leader-in-exile, Stanislaw Mikolajczyk, became deputy prime minister. But the communists swept to full power in dubious elections in 1947, Mikolajczyk was accused of being a foreign agent and had to flee into exile. Churchill was only too aware of what might happen. After 16 Polish underground leaders disappeared following a meeting with Red Army officers, Churchill wrote to Stalin and lamented the way matters were developing. "They [the British people] can never feel this war will have ended rightly unless Poland has a fair deal in the sense of sovereignty, independence and freedom, on the basis of friendship with Russia. It was on this that I thought we agreed at Yalta," he wrote. Poland, however, did not gain the sovereignty, independence and freedom for which the war had been declared until many years later. The Cossacks are another people with bitter memories of Yalta. Some of them had been recruited to fight with the Germans and Stalin got Allied agreement that all Soviet citizens should be returned home. Thousands of Cossacks were on the Western side of the lines and their return in many cases meant their death. Churchill, and particularly Roosevelt, were later criticised for giving way to Stalin. However, the historian A J P Taylor, in his Oxford English History 1914-1945, was more understanding. "Soviet armies controlled most of eastern Europe, and the Western Allies had no resource other than Stalin's good will," he wrote, "unless they fell back belatedly on an alliance with Hitler - a course which no-one contemplated."